This thing goes with me EVERYWHERE! It fits in my purse. I take it with me shopping, to church (you know how thirsty you can get!) to meetings, on road trips, on walks. And I refill it just before bed and leave it next to my bed for the night. I love how much water I drink with this thing always around. I'm not really a water drinker, you see. I was born and raised a Kool-Aid girl. Then there is my slight milk infatuation. Did you know Ian and I go through almost 4 gallons of milk a week? I kept track this past week, and it's true! I told my momma and daddy that, and the first thing they asked was "well, is it at least slim?" Right, water. I always get sidetracked on here, but it seems so important in the moment! I get through at least two a day (that's a total of 40 oz!) I'm working my way up to a third refill. The best thing, is that it is less than 4 dollars! And ours was sold near the bottled drinks in our grocery store. They have another kind that is not a pop top, but opens up and is more "pourable," which, to me, translates as "spillable," so I vetoed that one. Go out and get one! I'm laughing, Britt! I have the pourable version of the same bottle! I love it though and I drink 3 of those a day! I had to work my way up to it though. Keep up the great work...your skin and your body will thank you for it! Love ya! I am definately going out and getting one of those! 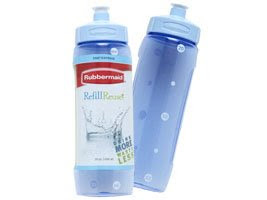 I have been looking for a good bottle to use for the gym but havent found one with a top that you dont have to screw on and off! That looks like the pull top correct?? Well if so, then yay! I should definitely buy one. I don't drink enough water...I'm an iced tea girl! Also, I'm glad to know that there is someone who goes through more milk than my husband and I do! We go through 1.5 - 2 gallons a week, and I thought that was a lot! I made my blog private (for a few reasons) but would be happy to add you as a reader if you're at all interested. If not, I'll miss your comments. And I'll continue reading your blog. i love getting/collecting water bottles! I completely agree with you and I need one! X.